At the end of the past week the price of the precious metal reached the maximum of the last two weeks because of the weakened American currency after the meeting of the Federal Reserve, note the analysts from Fort Financial Services. The precious metal was traded at the price of $1137.01 XAU- for the comparison, on Thursday the trade closed at the level of $1131.20 XAU having raised to $1139.40 earlier. Also, American futures on gold with the delivery in December increased in price by $19.80 and amounted to $1136.80 per troy ounce. The spot market is going to finish the week at a profit, which will be the first after the previous four. On Thursday, the Federal Reserve decided to leave the interest rate unchanged at (0.00-0.25% per annum), explaining it by the dissatisfaction with weak economies around the world. However, Janet Yellen, during her speech to the press, mentioned that there is a possibility of raising the interest rate this year. The US dollar indicator, against the basket consisting of six main currencies, has dropped to the minimum of the past three weeks based on the decision of the American regulator. The low interest rate is very beneficial for the precious metal which does not bring an interest income. Representatives of the numerous American banks believe that the national regulator will increase the key interest rate at the end of the year- in December. It must be noted that, in India this week the precious metal was discounted due to low demand. In the “Celestial” which is the largest consumer of gold, its value is higher than the global standard by 5-6 dollars. The delay by the Federal Reserve to lift the interest rate increases the demand for gold as the relative price for gold retention decreases and does not guarantee profit to the market participants. It should be reminded that on the 24th of July the gold collapsed- the metal has reached the minimum level of over five-year period- $1072.30, and the reason for that was the gossip about the increase of the interest rate by the Federal Reserve. Lately, talks regarding the timing of the key rate lifting in the United States take the main place in the world of stock markets. Currently, the market participants are expecting the next assembly of the Federal Reserve of the USA which is scheduled on the 27th and 28th of the next month. At the start of the week the price of the precious metal dropped due to the resulting decline in the stock markets and commodity markets. 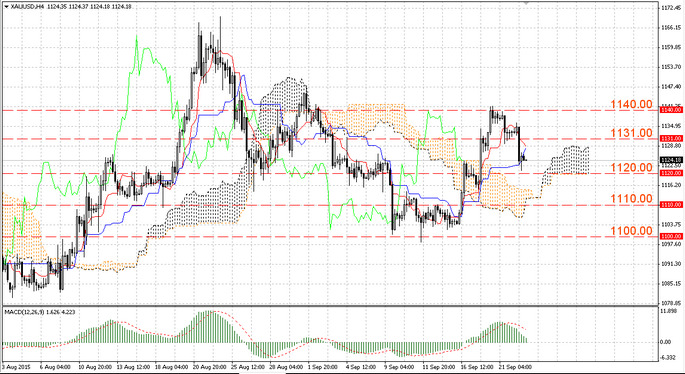 On Tuesday, gold was traded at $1125.00 XAU despite the fact that on Monday the closure of trading was at $1133.10 XAU. The reputation of the “yellow” metal as an asset with low-risk provides significant support to the market, say the analysts from FortFS. More information on the gold’s situation you may find on the website. The level of support is in the area of 1120.00 dollars per ounce. If the bears can push this mark, the quotation will be reduced to the level of 1110.00 dollars per ounce. The resistance level is located at 1131.00 dollars per ounce. In the case of growth of quotations and the breakthrough of this mark, quotations will rise to 1140.00 dollars per ounce.